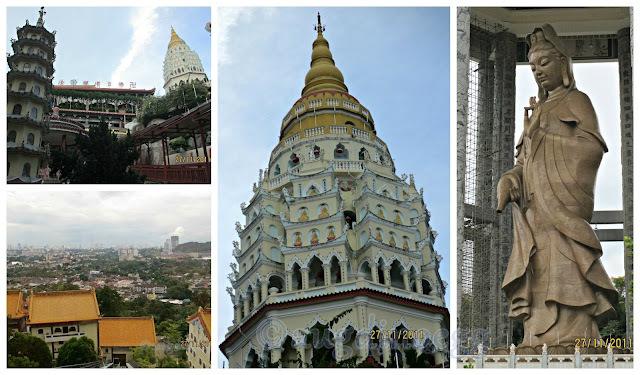 We decided to hop on the Around the World in 18 Days blog train with our trip to Penang, Malaysia on November 2011 which I did not managed to blog this down then, a very much belated post but nonetheless a very memorable one. First meet up with 2 of our facebook friends whom we've been talking to each other almost every day for the pass 1 year. We were very excited when planning for this trip, especially meeting up with the 2 ladies and their family. I went all out to get gifts for them and their kids, incidentally all boys! Its going to be a All Boys Party. DinoPapa made the necessary air tickets & hotel booking at Trader's Hotel (previously known as Shangri-la Hotel). 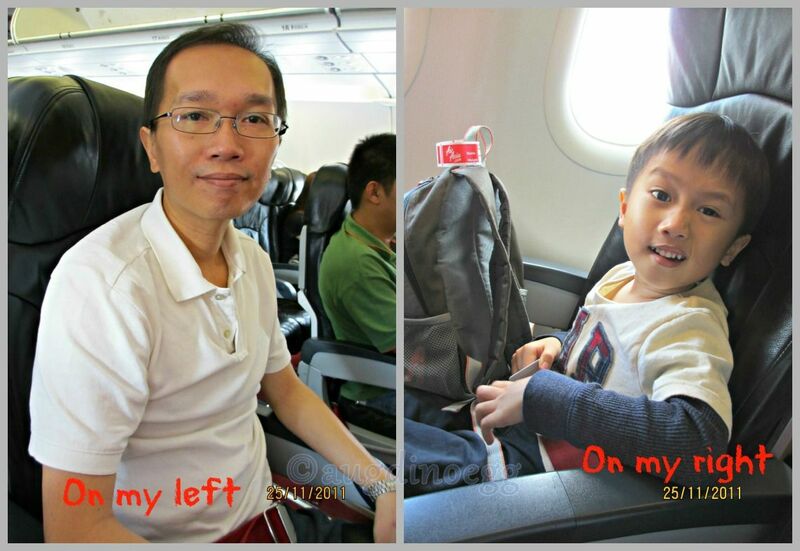 On 25 November 2011 the excited us set off to the airport for our 3 days holiday in Penang! We checked in at the airline counter, had our brunch n waited patiently for our departure time. DinoEgg of course is the most excited one. He practically "plaster" himself onto the huge viewing window looking at the planes & action down there the whole time when we were waiting to board the plane. Inside the plane waiting to take off! 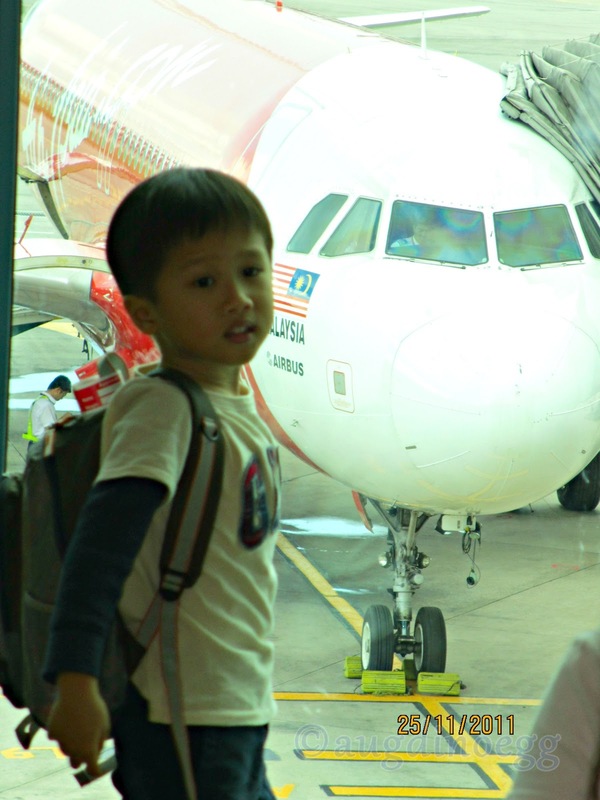 Shortly after, we landed in Penang, Malaysia! 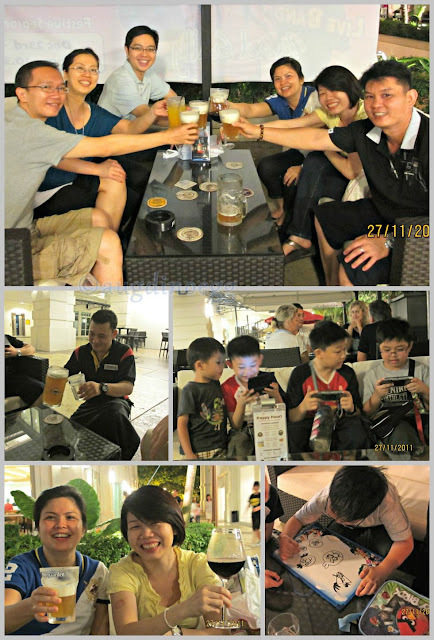 We took a cab to our hotel at Georgetown, Penang, feeling tired from rising early and the plane ride. I woke up early the next morning, my internal clock is still at work even though I'm suppose to be on holiday. Decided to take photos from of the view from our hotel room while the boys continue to sleep. 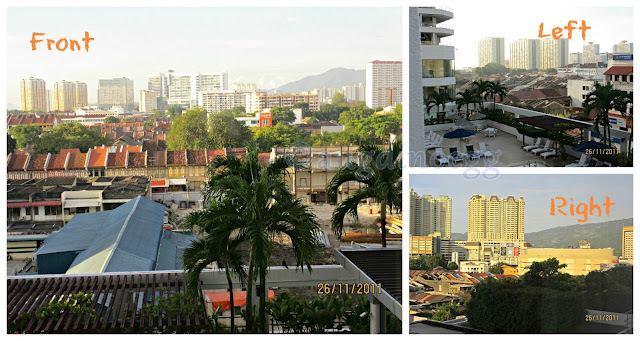 We always stay in this hotel as its sort of centralized, plus there are a few shopping malls such as 1st Avenue Mall & Prangin Mall which are at a stone throw away. After breakfast we went off to look for DinoPapa's aunt (Gu-ma 姑妈); DinoEgg's great aunt (Gu-po 姑婆) & officially starts our holiday in Penang with lots of food & minimal sight seeing. Aunt brought us to a relative's coffeeshop for a visit, know that we love local food she ordered the fried kuey teow, wanton noodles & Penang laksa for us the minute we sit down at the table. Ok I admit, I was too eager to get my mouth on these delicious food that I forgot to take a photo till *ahem* most of them are already in my stomach. Anne & her family came over to our hotel to pick us up to their house where Jenny is staying over during the trip. We chatted like we know each other for a long time though its the first time we are meeting each other. 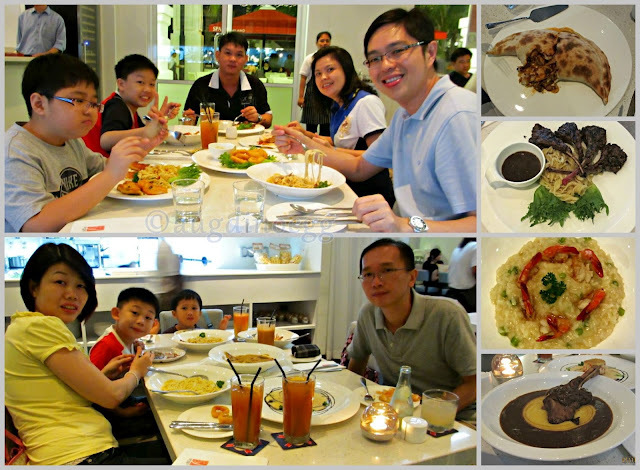 Later on we went over for dinner at Bali Hai Restaurant at Persiaran Gurney. Their seafood are very fresh, food are delicious too. The kids ran off to see the live sea creatures after they had their fill. Look at the HUGE Alaska crab in the photo! Our late night supper @ 1030pm!!!! 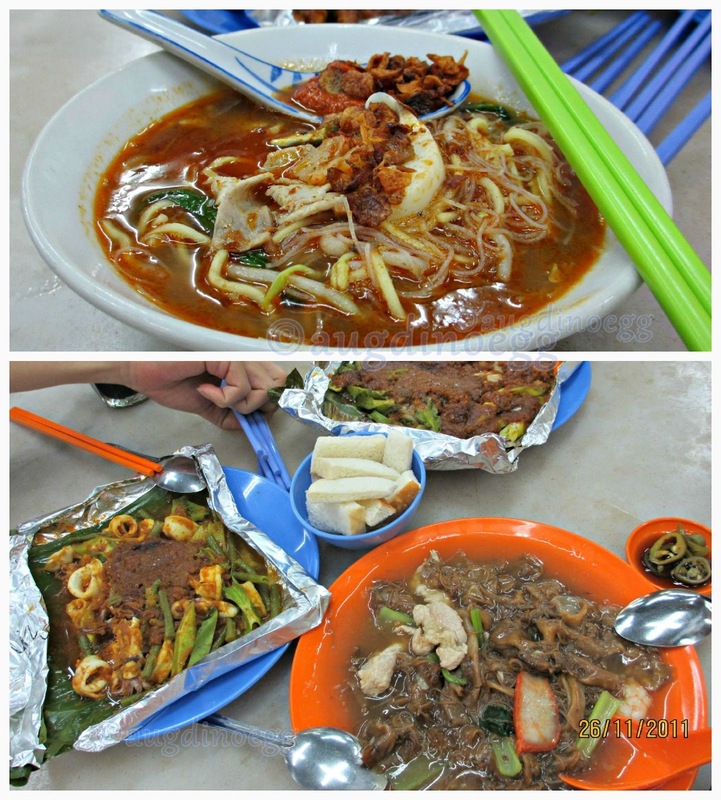 Irresistible prawn noodles, sambal sting ray & hor fun @ another relative's coffee shop. We really couldn't eat any more but just cannot resist them yummy food. Our breakfast at Kedai Kopi Genting, trying out the local breakfast. The chee cheung fun, famous for its peanut flavour prawn paste sauce is a must try. Next stop is to Kek Lok Si - The Temple of Supreme Bliss. As the temple is built on a hill you will see steps, steps and more steps as you climb up towards the temple; unless of course you drive then you can zoom up to the top in minutes. 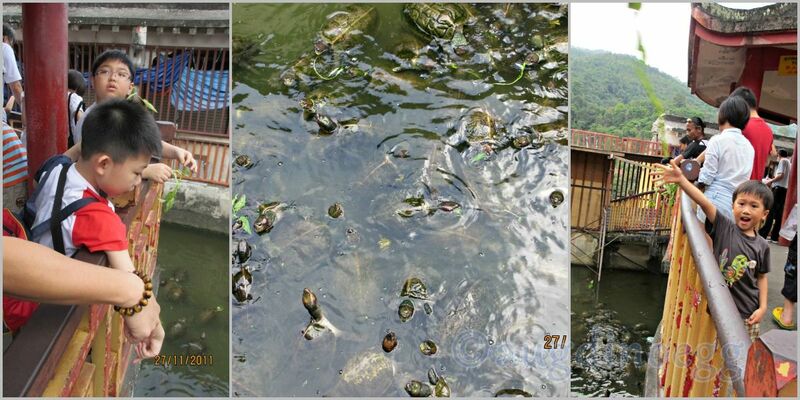 Feeding of the turtle is a MUST for the kids, you buy a bunch of fresh kang kong at RM2 (I think) to let the kids have like 10mins of fun throwing the veggie over the railing for the hungry turtles. If you are very devoted and wishes to visit all the halls offering your prayers, you can make a slow ascend to the top. Alternatively you can take the inclined lift (RM2 for both ways) for a slow but comfortable air conditioned ride up. When you are there you can see the 30.2m bronze statue of the Kuan Yin "Goddess of Mercy" and the seven storey Pagoda of 10,000 Buddhas that combines a Chinese octagonal base with a middle tier of Thai design, and a Burmese crown, reflecting the temple's embrace of both Mahayana and Theravada Buddhism. You can take a rest at the garden or take photos with the stone status of the 12 Chinesse Zodic animals. In the evening, we head off to Straits Quay Marina Mall where we went for Popular Warehouse Sale! So what we are on holiday? It will be doing ourselves an injustices to miss this great bargain! After jostling with the locals in the warehouse sale we head of to have a classy Italian dinner at Spasso Milano. We are a big group with 4 noisy boys, its testing for every one especially when every one's trying to talk at the same time & the boys declaring to the whole world that they are HUNGRY! The waiters were patient and fast in arranging 2 tables to accommodate 10 of us in shortest time and to make us as comfortable as possible. While we wait for our food, the boys ran off to see the chef mixing, rolling, flipping the dough & making the pizza. They were amazed with all the action inside that small "kitchen" and seeing the chef putting the pizza dough into the oven & taking it out mins later. Group photo while enjoying our delicious food. These are only some of the food that we are having, every one's too hungry to wait for the photographer aka ME to snap a picture before attacking it. 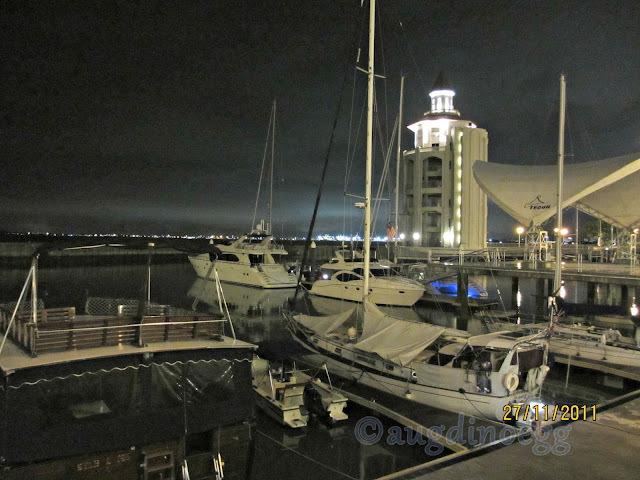 After our good dinner we walked around along the waterside for some cooling sea breeze and awwing at the yachts docked at the side. What better way to end the night of good company with some good beer? We head off to Weissbrau, a German Bistro & Bar. The bar was kind enough to close one eye on the 4 noisy boys and allowed us to sit down and have decent beer. Of course the boys are at the next table with their PSP & gameboy. DinoEgg do not have either of those but he is content just to sit beside the older boys to watch them play. Since we had a late night yesterday plus Jenny wants to go to the local market to buy some local delicacies, we decided to meet up in the afternoon instead. We went shopping at 1st Avenue & Prangin Mall, had light lunch at 1st Avenue as we were still full from our heavy breakfast in the hotel. The heat got the best of us and we escaped back into the hotel for some cooling air con n comfy bed. Anne met us at the hotel and we head off to collect our order of Penang's famous Him Heang (馨香餅家) tau sah piah. She was kind enough to place order a few days ago so we do not need to stand in the queue to buy or pay for the goodies, we simply collect from them when we reach there. The traffic at their shop is very bad as many people; locals & bus load of tourists, wants to get their hands on their pastries. Strongly suggest that you call them to place an order to avoid the crowd. We went for late lunch at some place, I've forgotten the name but its a big food court. 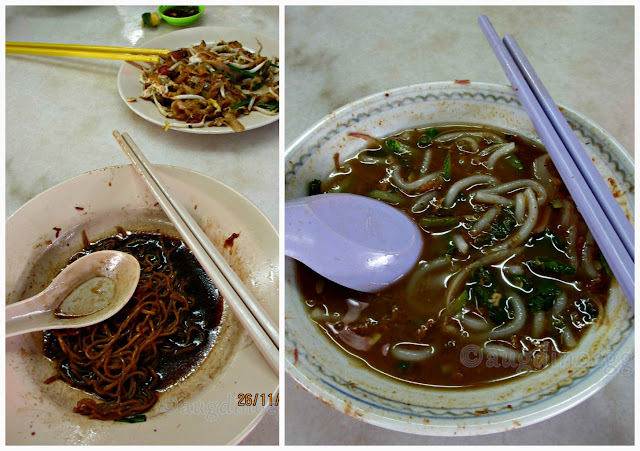 We had delicious local food again, I forgot to take photo as I was too busy eating. 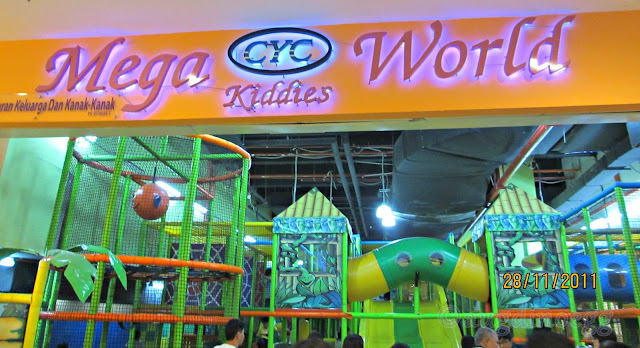 We sat down for some coffee and catching up at Starbucks in Sunway Carnival Mall but not before we drop the boys at the Kiddie World. Its something like our Kids Explorer or Polliwogs. The boys had an enormous time running up and down, through the tunnel, here & there, giving themselves a great work out. 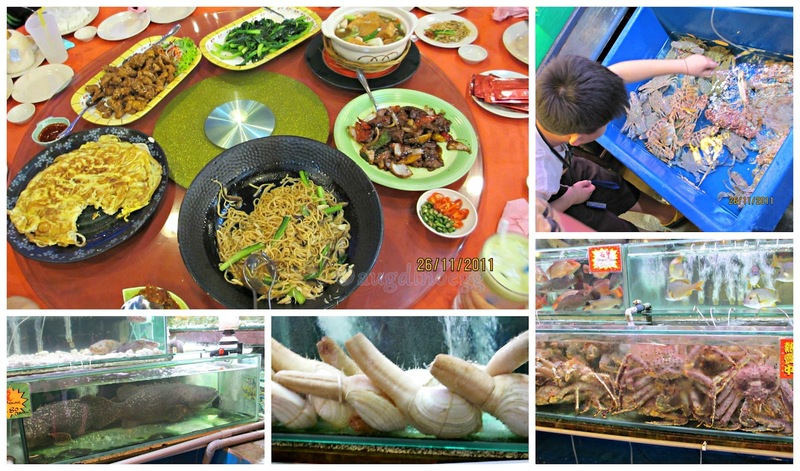 We ended the day with a sumptuous crab & seafood dinner at Hai Wong ( King Crab) Restaurant in Bukit Tambun. 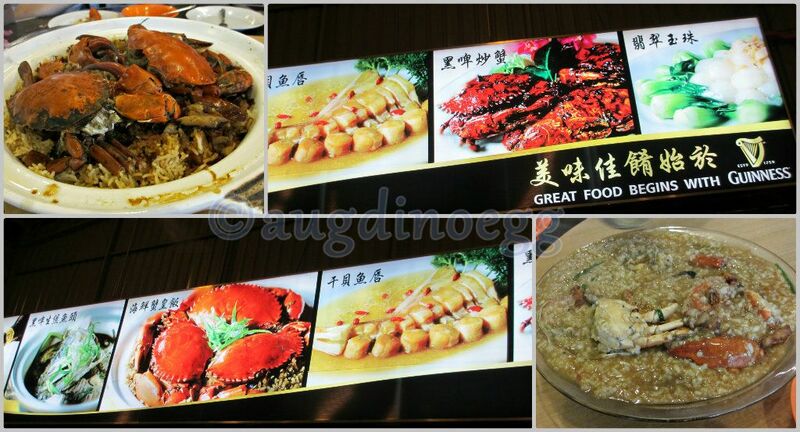 Anne ordered their famous crab fried rice & porridge, both dishes are cook with crabs & alot of crab meat. The crabs are big, fat & juicy even DinoEgg who is eating it for the first time is enjoying it. 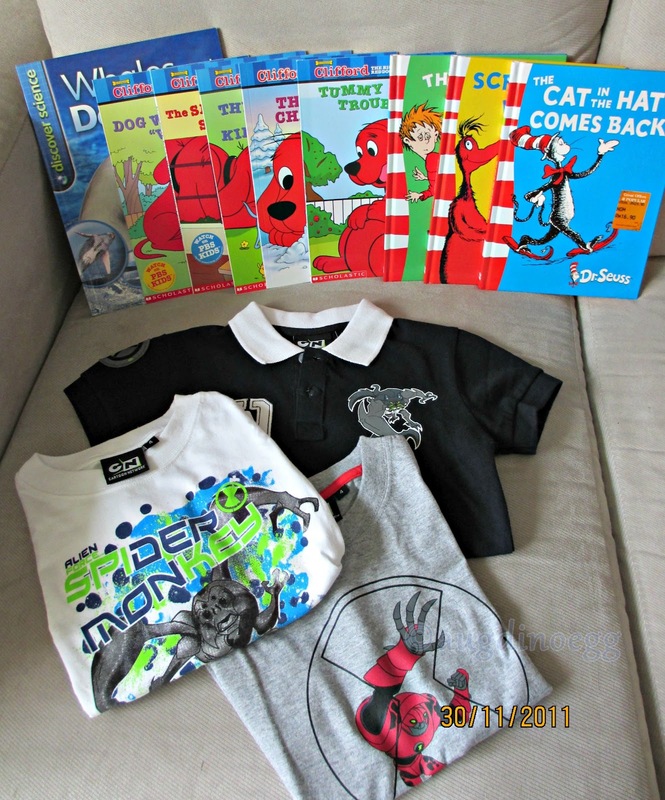 And DinoEgg's shopping loots, great buy & bargain of books and clothes. Here are the address of the makan places we went during these 3 days. May you have a wonderful time as we had. This post is part of a Blog Train hosted by Madeline at MadPsychMum. 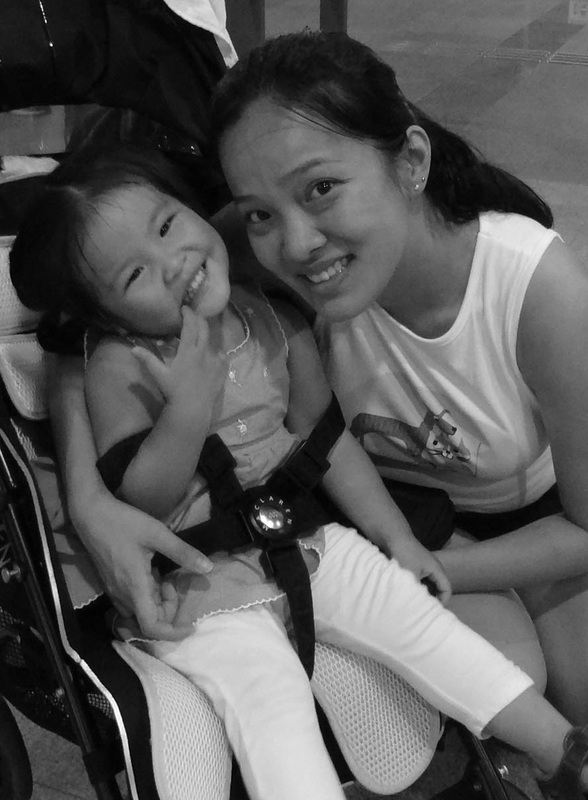 Continue your journey around the world through the eyes of Singapore Mom Bloggers! Winnie is a FTWM to a pair of girl and boy, aged two and a half years and six months respectively. She home teaches and is a firm believer of play and the great outdoors. She shares her parenting and home teaching adventures at ToddlyMummy. Jen. 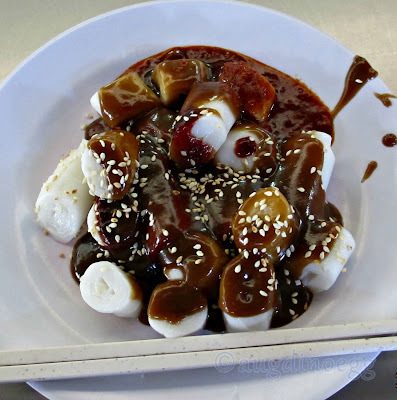 The chee Cheong fun is... Is.... So shiok... To look at. I want!!!! I love the heikor as sauce! Adeline, me too! I look at those food I wanna fly there now.